A tale of two Hyundais. One, made in Turkey, is a sensible small family hatchback with a sweet one-litre petrol engine and automatic gears. That’s the blue car, the i20. The other is a slightly larger family hatchback. Then it got hotted up. That’s the paler blue car, the i30N Performance. It is made in the Czech Republic. 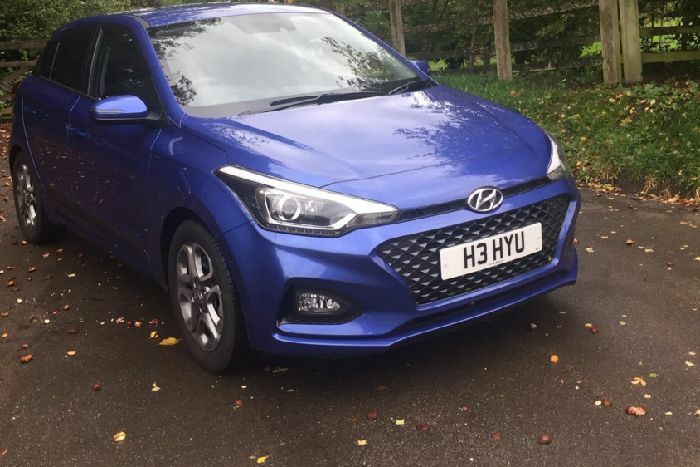 First, the Hyundai i20, the South Korean company’s answer to the Polo, Fiesta, Corsa, Clio, 208, Yaris and several more popular four-metre hatchbacks. The recently refreshed five-door supermini gets you the 75ps 1.2S petrol. Standard stuff includes DAB radio, a seven inch screen, Bluetooth phone connection, rear-view camera and automatic headlamps. My demo car was a few rungs up. The Premium Nav had a gem of an engine, the one-litre, three-cylinder petrol with GDI – gasoline direct injection. This sprays petrol directly into each cylinder to improve power and fuel efficiency. It delivers 100ps or 98.6bhp and 127 lb ft of torque. Fitted with a seven-speed dual-clutch automatic gearbox, it is rated at 56.5mpg, 114g, and 0-62mph in 11.4 seconds. I loved every mile, every minute in this car. I took it hundreds of miles up and down motorways, criss-crossed valleys, did my faux commuting run. It averages 44 to 50 miles a gallon. It ran smoothly and quietly and was a doddle to steer and use in town, helped by the eager engine and the seemingly perfect automatic gearbox. The speed sign recognition blotted the clean sheet, though, by failing to register temporary overhead signs or long-standing 50mph average speed sections. The interior is roomy for four, not bad for five. It is big enough for most things, nippy and potent if you want to dive and duck in and out of traffic, get a move on, without much offence. It is, after all, only a dark blue small Hyundai hatchback. There are door pockets with irregular contours which allow packaging of things like wallets and water bottles. Much of the synthetic covering has a soft pebble finish. There is a drop-down specs holder. In Champion blue, the model tested comes with navigation, electric power steering, 16-inch alloys for a comfortable ride, climate control. 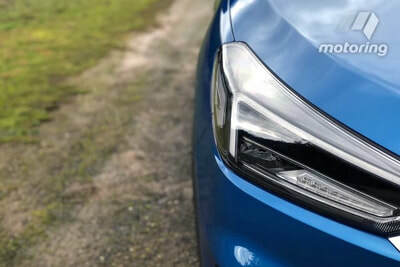 The headlamps have a cornering beam and high-beam assistance. I can imagine a happy life with this car, enjoying racking up the miles in the five-year warranty. In pale blue the i30N Performance looks misleading. The colour is actually Performance blue. Then you notice the red detailing front and back, the red brake callipers with the N logo, the 19-inch alloys with classy N spec 235-35 Pirellis, the N logo in the grille. N stands for the Namyang R&D centre in South Korea and Nurburgring, the long distance German race track where this Hyundai and a few other N models were tested. I wonder whether British regions with good driving roads could market an appellation. Viz, H for Highlands, Y for Yorkshire or N for Northumberland. 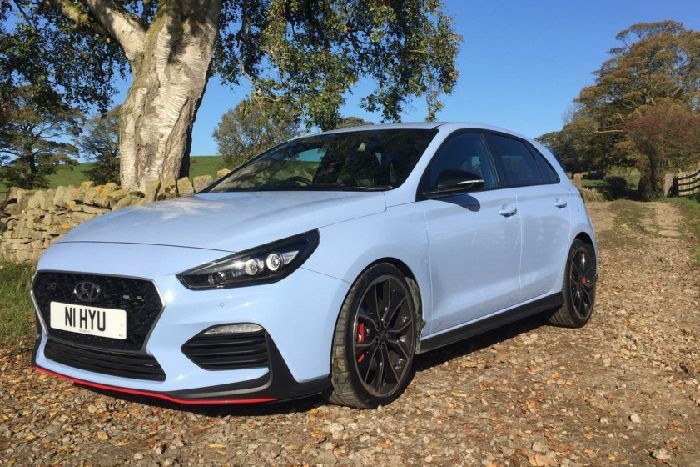 The i30N Performance is a stonking driving car. It inherits the brand’s rally and racing pedigree. The 2-litre turbocharged petrol engine delivers 271 bhp (275ps) at 6,000rpm and 260 to 279 lb ft of torque from 1,500 to 4,700rpm. The 0-62mph time is 6.1 seconds. Top speed is restricted at 155mph. It is rated at 163g and 39.8mpg. By coincidence, these figures are almost identical to Renault’s equally exciting Mégane R.S. These cars, and their peers from Ford, Volkswagen and Seat, are the real deal. Like any very powerful front-wheel-drive car, they need help to get the power down cleanly – in the Hyundai an electronic limited slip differential. They have much better brakes, a lowered ride height, adjustable settings. The Hyundai has five modes, which adjust engine response, suspension stiffness, stability control, steering weight, the differential and the exhaust note. It will even blip the throttle to give a smoother down change through the six-speed gearbox. Open the boot and you see something extra, a bracing strut across the floor between the wheel arches. It remains at heart a usable and well-equipped family hatchback – a couple of inches wider across the interior than the Hyundai i20. It has smart-phone links, eight-inch navigation screen, a phone charging pad, puddle lights beaming from the gloss black door mirrors and lots more. The pace is exciting – accompanied by a series of white, orange and finally a red band in the instrument cluster which suggest gear-change points. Driven briskly and legally it averaged 30mpg. Two significant Hyundais, showing the strength and range of the South Korean brand. I’d live happily with either but the automatic i20 is more sensible given our speed limits. 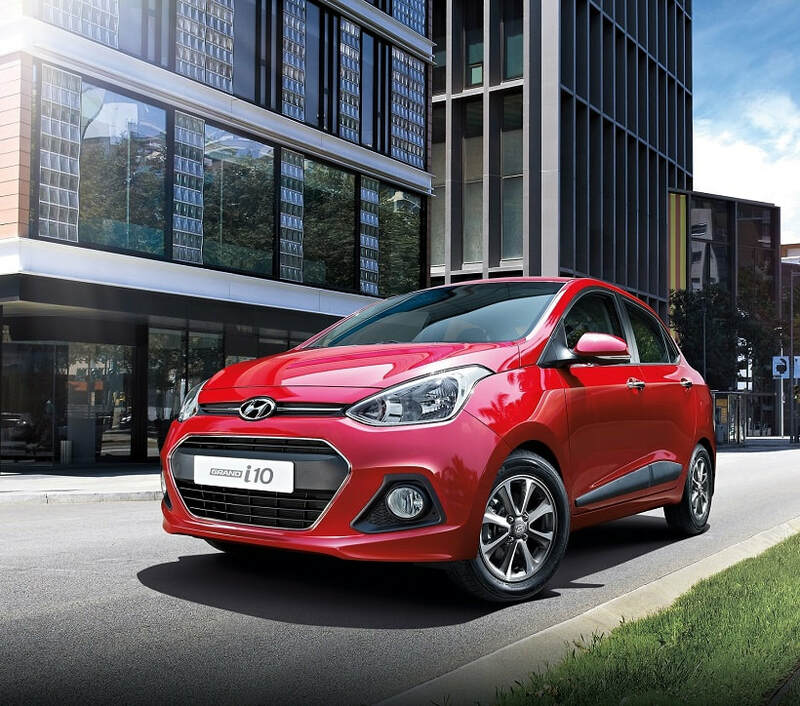 Test drive the Hyundai i20 at Group 1 Hyundai and decide for yourself. The Hyundai Grand i10 first entered our market about a decade ago. It was Hyundai's entry into the growing A-segment. It enjoyed its time as a popular, decently equipped econobox. Fast-forward a few years later and it was replaced by the much more refined second-generation model. This time Group 1 Hyundai received the then new Grand version, a longer wheelbase model originally developed for India. This one was positioned above the new entry-level Eon and the subcompact Accent. It was a nicely styled hatchback that featured European-inspired looks. Its roomy interior was also a big plus. Sadly, what could have been a serious Mitsubishi Mirage fighter was hurt by its uncompetitive pricing. The mini car eventually faded away from the dealership. During its absence from our market, it received a minor refresh. Up front, it gained a restyled front fascia with a more dynamic looking cascading grille. Reshaped fog light housings now have integrated LED daytime running lights and air curtain openings for improved aerodynamics. At the rear is a new bumper with large round reflectors flanking the license plate recess. New alloy wheels complement the car’s updated design, too. Changes inside are mostly trim-related, which is not a bad thing since the Grand i10 had a nice dashboard layout, to begin with. While these changes are only cosmetic, it gives the little hatch a more upmarket appearance. 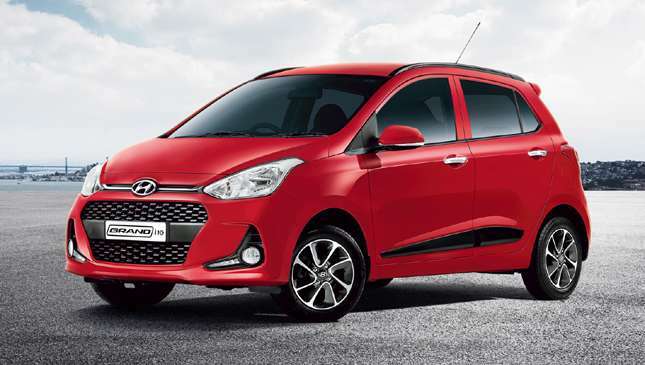 Outside India, the 2018 Grand i10 is offered with a pair of inline-4 gasoline engines: a 1.0-litre Kappa mill that makes 65hp and 94Nm; and a 1.2-litre Kappa unit producing 86hp and 120Nm of torque. In India, a 74hp 1.2-litre U2 CRDi oil-burner is also available. In our post-TRAIN law market, a small gap has opened up between the tiny city cars and the subcompacts. Perhaps Hyundai Asia Resources Inc. should consider bringing back the Grand i10 to fill the void between the Eon and the Accent. A rematch between the Korean hatch and the Mirage would be interesting to see. 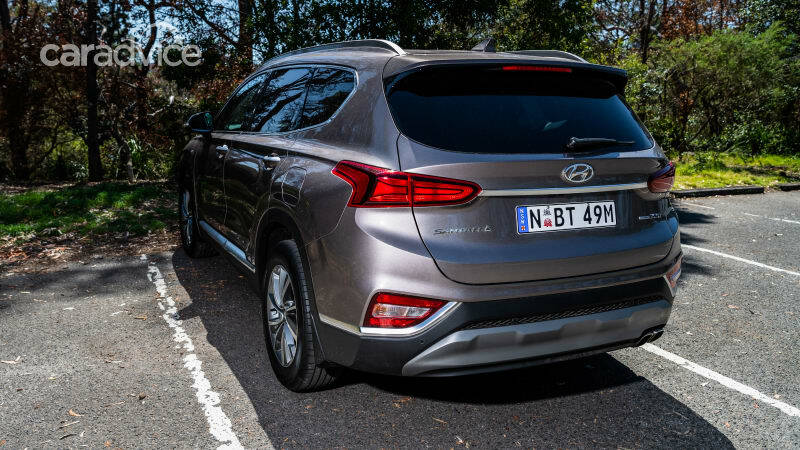 The Hyundai Santa Fe Highlander won CarAdvice’s seven-seater-SUV mega test, but does the mid-range Elite maintain the form or drop the ball? The Santa Fe has been a consistently respectable model throughout its existence, which is not something you could say about every Hyundai released prior to 2007’s brand-transforming i30 hatch. Now this fourth iteration since the Santa Fe’s 2000 debut must step forward to ensure it is competitive, against what must now be considered a glut of large seven-seater SUVs. The Hyundai’s starting price is typical for the segment, though here we’re testing the mid-range Elite. We literally stepped straight out of a Tucson Elite into this Santa Fe Elite, which made for a conveniently immediate in-house comparison. 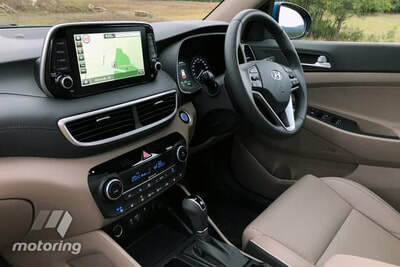 And the first surprise is that while the Tucson has a more premium-looking cabin after its mid-2018 update, the Santa Fe succeeds in feeling like another step up – with an upmarket vibe that will hold it in good stead if being cross-shopped against the classy cabins of the Tiguan Allspace and CX-9. Common to all Santa Fes is an expansive, soft-touch dash – complete with a stylish arcing design that blends naturally into the doors. If that design flourish could have been inspired by the interior of Jaguar’s XJ limo, there’s another Brit nod with the Bentley-esque quilted sections of the Elite’s standard leather seats. More left-field is the distinctive ‘melange twist’ cloth trim applied to the pillars, visors and roof lining. 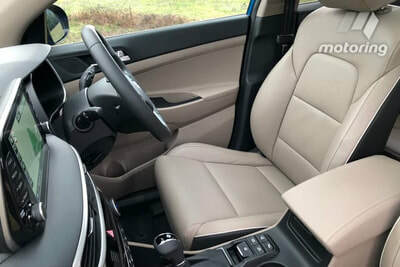 Our test car also featured an optional “dark-beige” interior hue that the team appreciated in the Tucson Elite – even if we think it’s more caramel in colour. 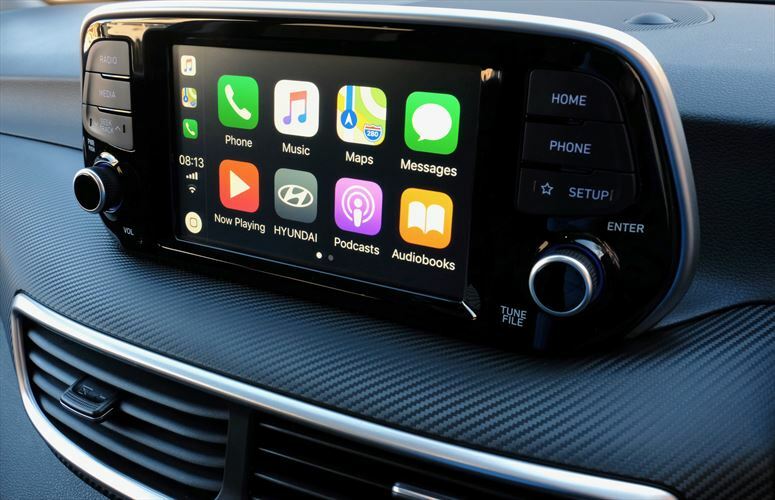 As in that sister SUV, the Santa Fe Elite features a ‘floating’ 8.0-inch touchscreen as a smart-looking focal point for infotainment that benefits from a (great-sounding) 10-speaker Infinity audio system and Apple CarPlay and Android Auto. The Elite also adds navigation over the 7.0-inch system in the Active (which does get the smartphone mirroring tech). Buyers need to step up to the Highlander (as about half did with the previous Santa Fe) to get a high-tech digital instrument cluster, wireless charging, head-up display, and the most advanced version of Hyundai’s Auto Link smartphone app that allows various remote vehicle functions, such as locking/unlocking, hazard lights and horn, and cabin temperature setting for when the engine is started. 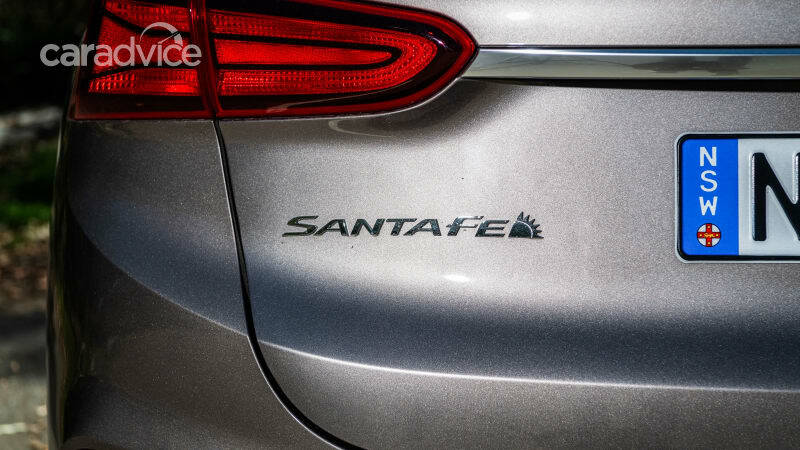 Every Santa Fe makes it easier to get into the third row than previous models. Simply press a button on the kerbside second-row seat base and the seat tips and slides forward automatically to create an entry gap to the rearmost pews. There’s a distinction between '5+2-seaters' and 'seven-seaters' in this segment, and the difference in vehicle size can be just 69mm. 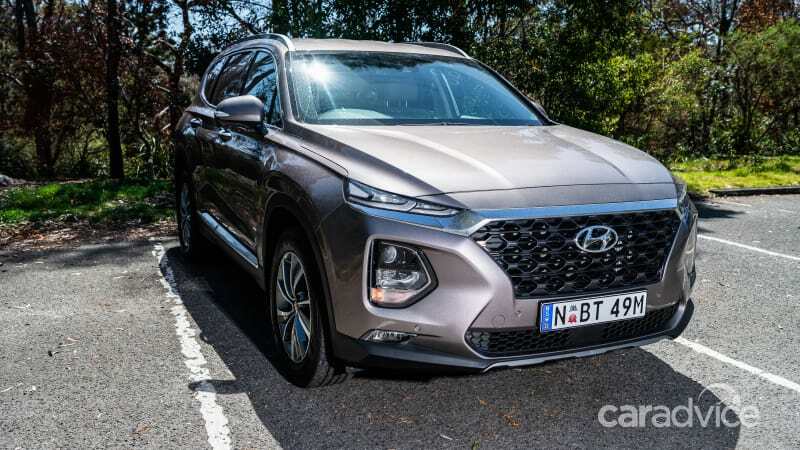 That’s how much longer the Santa Fe is compared with Volkswagen’s Tiguan Allspace, and it’s the Hyundai that sits in the latter camp whereas the German SUV is in the former. 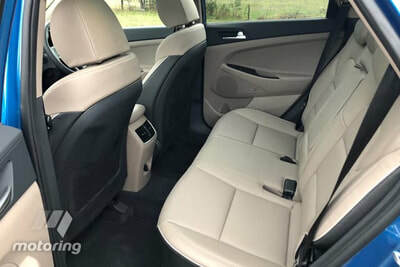 Aided by sliding second-row seats, there’s a decent amount of knee space in the third row for the average adult, whereas the Allspace is strictly a kids-only area. Ventilation and storage spaces are provided back there. The Santa Fe’s curtain airbags also deploy from across the first and second rows only, limiting their help if there’s a side impact towards the very rear of the vehicle, though Hyundai says the airbags extend to the rearmost window to protect third-row occupants from glass debris. 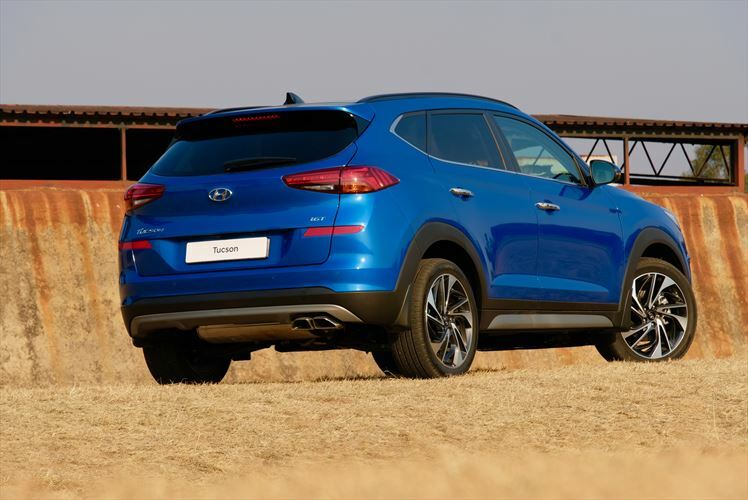 A 6.5cm-longer wheelbase – accounting for most of the new Santa Fe’s 7cm-longer body – liberates some extra cabin space, ensuring there’s plenty of second-row leg room even if you slide the bench forward to give rearmost passengers some extra space. A flat floor helps to accommodate three abreast, and there are two USB ports to keep smartphones and other devices charged on longer trips. For any parents who have accidentally walked away from their car with bub or toddler still strapped in aboard, they will appreciate the Rear Occupant Alert feature in the Santa Fe Elite (and Highlander). Using an ultrasonic sensor to monitor pressure on the rear seats (after the rear doors have been opened and closed), the system will first provide a visual reminder to ‘Check rear seats’ on the instrument display when switching off the car after driving. 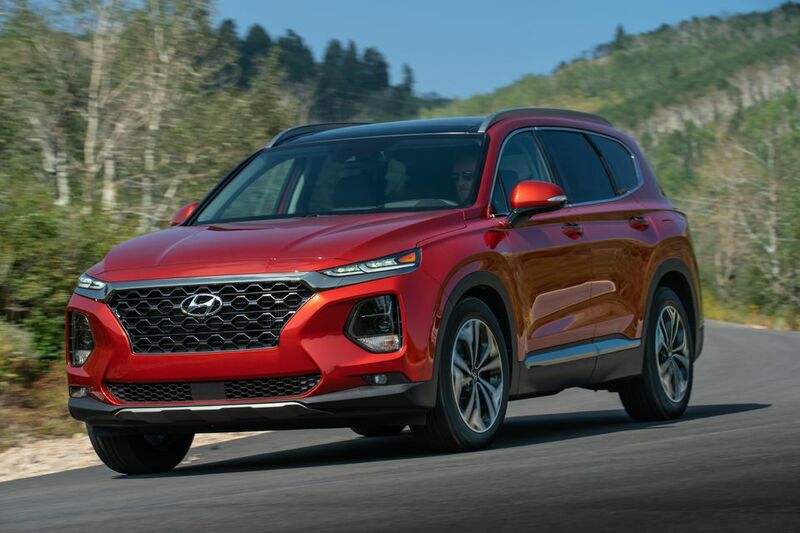 Ignore that, lock the car, and start heading away from the car with someone still in the back seat, and the Santa Fe then blasts its horn to prompt a swift return. That’s also triggered if kids lock themselves in the car by accident. There’s also a variation on Audi’s Exit Warning system, where the Santa Fe will provide a visual and audible warning if the driver or rear-seat passenger immediately behind start to open the door when the vehicle’s radar has detected an oncoming vehicle. Elite and Highlander models also feature a ‘smart’ tailgate that will open automatically if you’re returning to the car and stand behind the vehicle for three seconds – useful if your hands are otherwise occupied with shopping bags. All Santa Fes are equipped with autonomous emergency braking, drowsiness alert, blind-spot monitoring, rear cross-traffic alert and lane-keep assist. We were prompted to switch off the lane-keep assist as the system is intrusive. Operating from 60km/h and above, it’s designed to help keep you centred between lane markings. But it’s overly sensitive, and even when you seem to be smack-bang in the middle of a lane, it feels like the steering is trying to fight your attempts to turn it in the desired direction. Once off, though, the Hyundai’s steering is far more pleasing. The low-speed ride isn’t quite as compliant as the Tucson’s, but the suspension avoids any major disturbances and becomes even better at smoothing out progress on country roads. 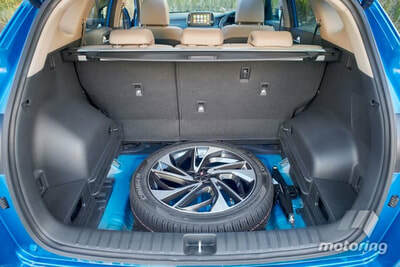 There’s some rumble from the Santa Fe Elite’s 18-inch wheels, though it’s not irritating and, in a way, simply highlights the Hyundai’s generally excellent cabin refinement – benefiting from some extra soundproofing measures for 2018. 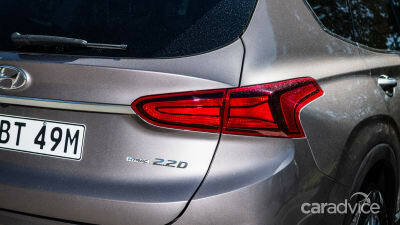 Hyundai’s trusty 2.2-litre four-cylinder turbo-diesel carries over and is also fairly muted most of the time, if not as quiet as the CX-8’s 2.2-litre equivalent – especially when more revs are on board. The engine doesn’t need many revs, though. While there’s a touch of lag right off idle, a generous 440Nm delivered from 1750rpm to 2750rpm combines with a new, smooth-shifting eight-speed auto for relaxed momentum – getting punchy when the driver demands more urgent response. Drivers can determine how torque is distributed to the front and rear wheels via a Driver Mode button. Eco makes the Santa Fe predominantly a front-drive vehicle for fuel economy, the default Comfort mode sends about a third of the torque to the rear axle, while Sport splits torque evenly. In all modes, the all-wheel-drive system adjusts automatically for slippery surfaces. 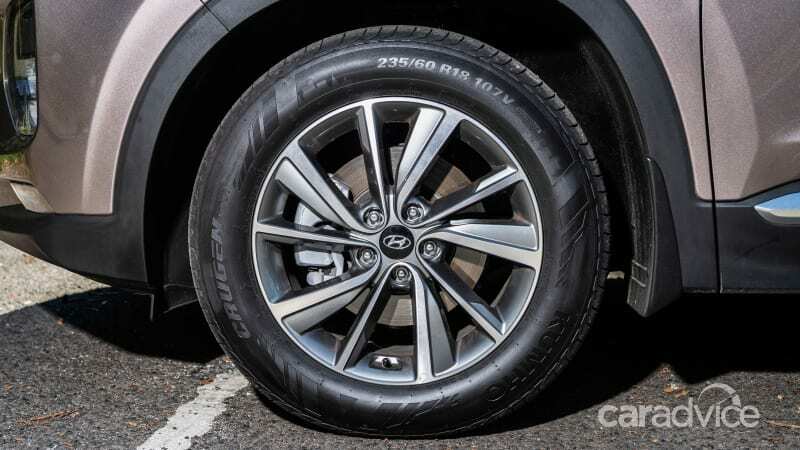 Consider that helpful for wet roads or gravel tracks, as the Santa Fe’s 185mm ground clearance isn’t going to tackle anything too demanding away from the bitumen. Comfort was our preferred mode, as throttle response is dulled in Eco and the auto transmission becomes a bit too busy in Sport. Fuel economy is rated officially at 7.5 litres per 100km, and according to the trip computer, we averaged 8.2L/100km during testing. That helps running costs (even if the turbo-diesels in both the CX-8 and Tiguan Allspace 140TDI have even lower consumption at 6.0L/100km), as will capped-price servicing that averages $419 per annual visit over a five-year plan (with maximum annual kilometres pegged at the average 15,000km). The Hyundai Santa Fe’s factory warranty covers five years. In tandem with the improved MY18 Tucson, Hyundai now offers a formidable line-up of highly tempting SUVs for families at Group 1 Hyundai. I grew up in Bushbuckridge in Mpumalanga, which is about 400km away from our offices in Johannesburg. If you require a very capable and reliable car - consider the facelifted Hyundai Tucson 1.6 TGDI Elite. With 130kW available at 5 500rpm of power and 265Nm of torque at 4 500rpm, this one slots in just below the top-of-the-range R2.0 Elite Turbodiesel automatic model. The car features a new front and rear end. 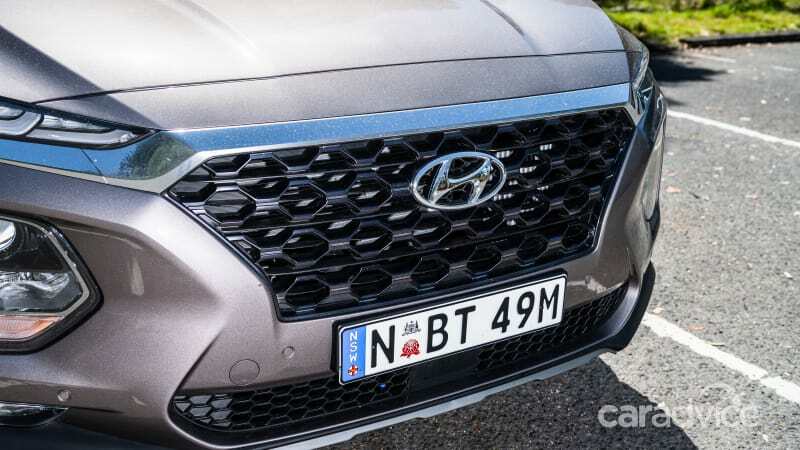 It has Hyundai’s signature grille along with a new design headlight, fog lamp, front bumper and skid plate. And it rides exclusively on beautiful 19- inch alloys. Inside it features a redesigned dashboard with a floating easy to-use seven-inch screen, a multifunctional leather steering wheel, driver and passenger electrically operated seats plus a panoramic sunroof. It has a four-cylinder turbopetrol engine plus a new seven-speed DCT gearbox. Leaving on a Friday afternoon, I filled the 62-litre petrol tank, with the driving range estimated at close to 650km. 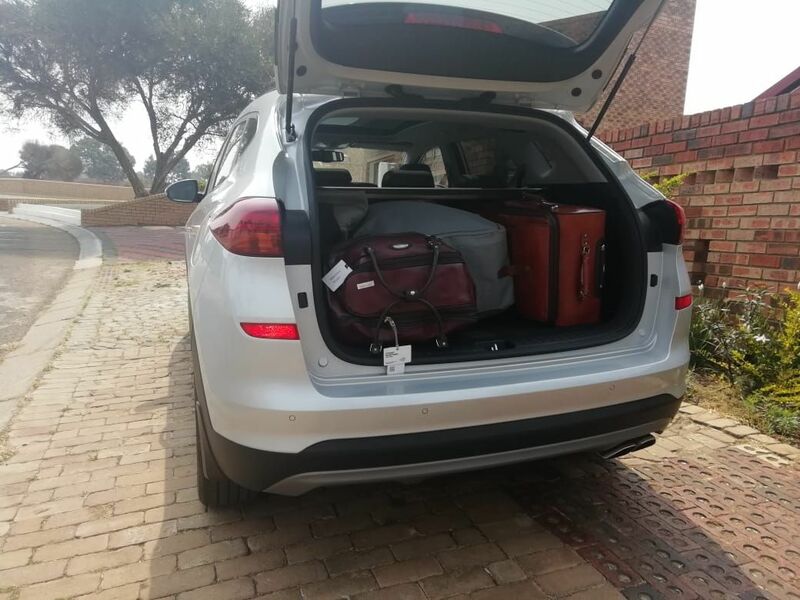 With five adult passengers in the car, it really attested well in terms of space and the boot, measured at 488 litres, took care of all our luggage. With two USB ports on offer (one in front and one at the back), Aux and Bluetooth connectivity, we were able charge our phones while on the move. 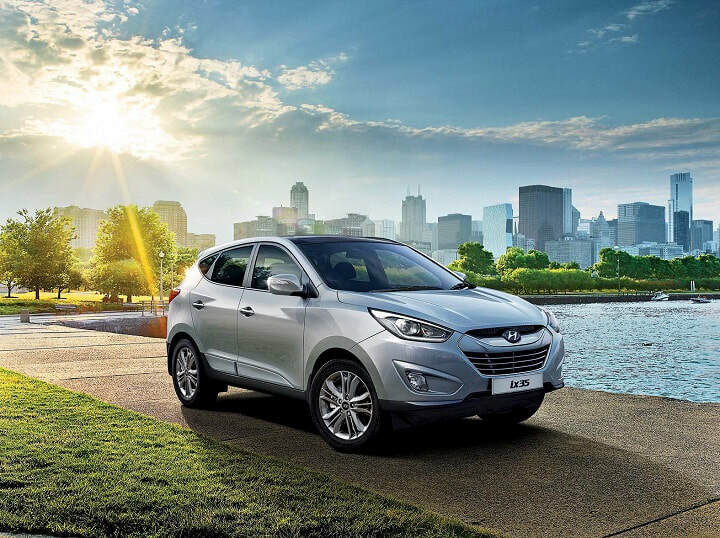 On the road, the Tucson is a quiet drive although the engine can feel underpowered during overtaking. Even so it possesses enough grunt in all seven gears, thanks to Hyundai not going the CVT way. Driving through mountainous roads, the car did not exhibit much body roll. There is ample grip, even in poor weather conditions and the light steering makes parking the large car an easy task. You get three driving modes: Eco, Comfort and Sport. I tried all driving modes on the road and I found it best in Comfort mode. Although you might not even consider driving your Tucson on gravel, it handles bumps with style. That is a fairly big number for a 1.6-litre engine but you still get impressive distance from a single tank. Safety comes from ESP, Vehicle Stability Management, Blind Spot Detection for side mirrors plus Cross Traffic Alert detectors. There are driver, passenger, side and curtain airbags that also keep you safe in case of a crash. It is a great SUV that has it all and Hyundai has done a wonderful job. 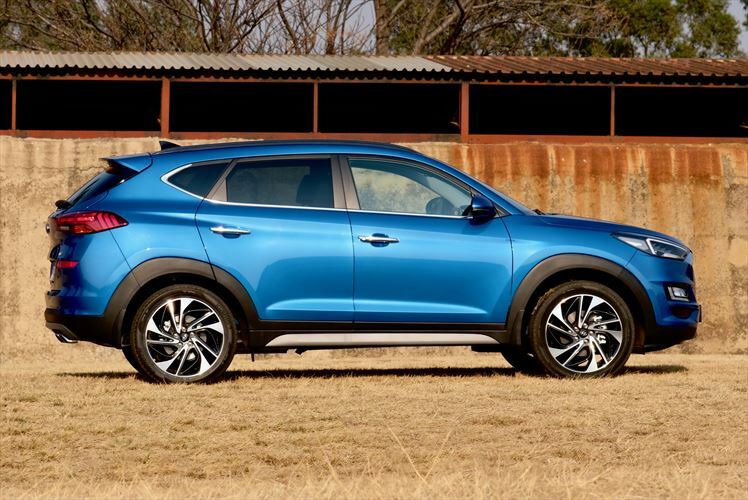 The new Hyundai Tucson is a comfortable, practical SUV, with great interior quality and an enjoyable punch on the road. 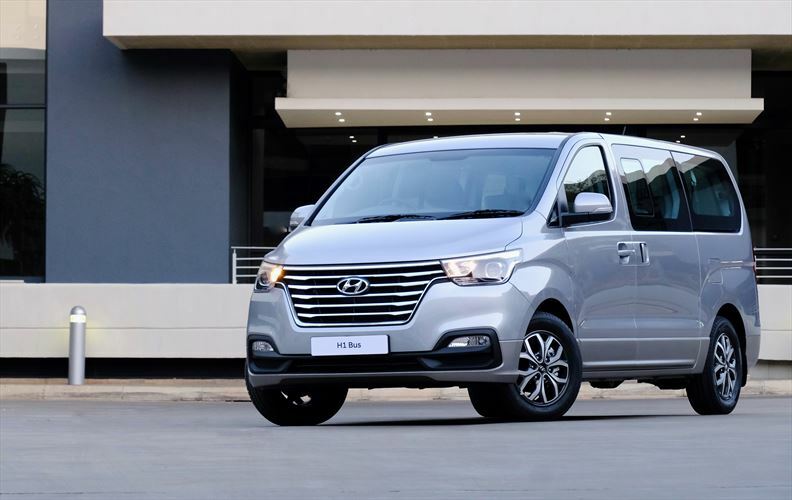 Now, the widely sold Hyundai H1 used or new has received a host of new features, but the most notable is its new grille design and more integrated front lights. Apart from the cosmetic changes at the front-end, the H1 now features a new set of alloys and also sports a host of improvements in terms of its interior space and safety systems. The vehicle also features both driver, passenger and curtain airbags, as well as a spattering of safety features. The inclusion of a large intuitive multimedia system at the centre of the dash has become a standard feature and as available throughout the Hyundai South Africa line-up, full voice-guided navigation is made available and integrates with the system. 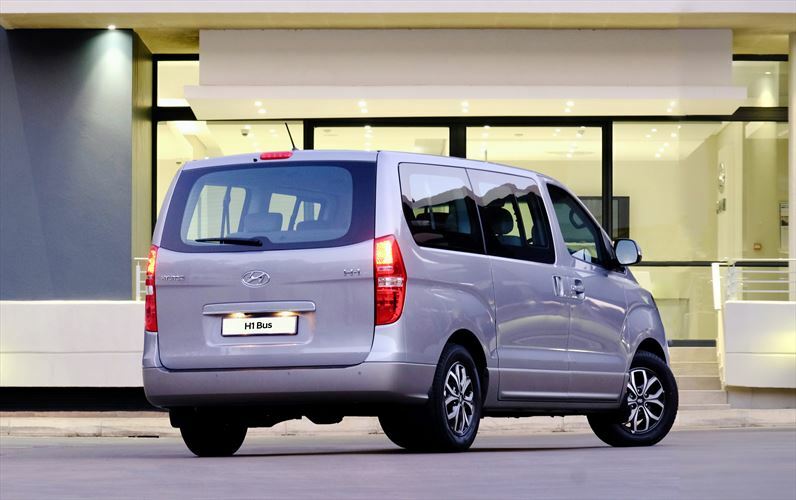 If you’re in the market for a H1 bus - view the available range of Hyundai H1 used models here from Group 1 Hyundai. Are you looking for a used Hyundai ix35 for sale? There are plenty of reasons to consider buying one of these attractive vehicles. While the ix35 is good looking it also delivers a powerful performance. The reliability of these models makes finding a used Hyundai ix35 a good choice. If you want to know more, here is some information about the ix35. ​Get ahead of the crowd in the new Hyundai ix35. The elegant exterior of the ix35 is available in pure white, satin amber and cool red. The used ix35 for sale is the epitome of perfection. Its state-of-the-art design and stylish curves attract attention wherever you go. Both powerful and sophisticated this model creates a bold impression on the roads. Its features are both aesthetically appealing and functional. The attractive headlamps increase visibility. The high and low beams help the driver to see in challenging conditions. LED lights contribute to the design of selected models. The ix35 is equipped with 17”alloy wheels. Formulated with silica these wheels offer improved fuel economy and increased durability. 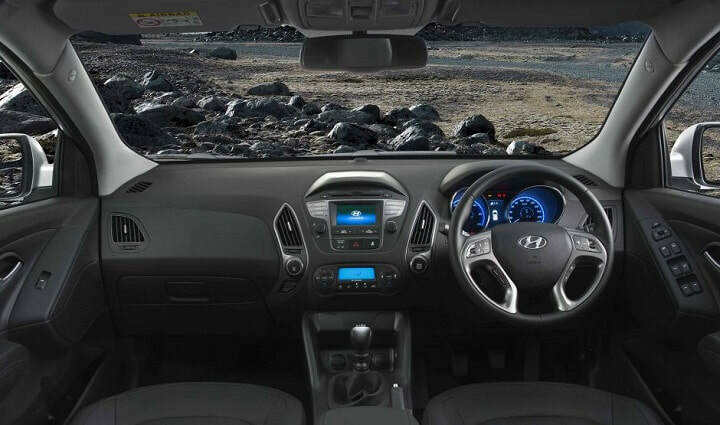 If you are looking for an SUV with an interior that creates a welcoming ambience, the Hyundai ix35 is for you. Its attractive design and comfortable features create a relaxing environment for both the driver and passengers to travel in. 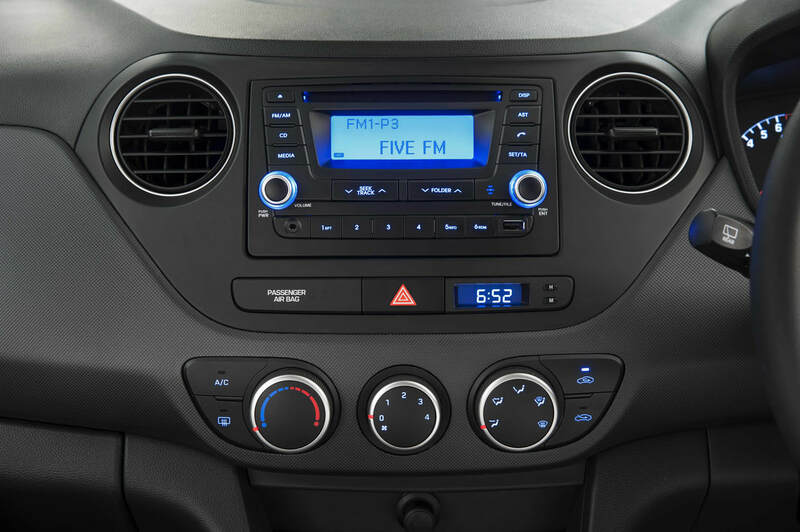 Its ergonomic design further contributes to the convenience of driving an ix35. The ergonomically designed dashboard is illuminated with a blue LED light cluster which gives you easy access to all the information that you need. The Executive and Elite models have climate control so that the cabin is kept at a pleasant temperature despite changing weather conditions outside. 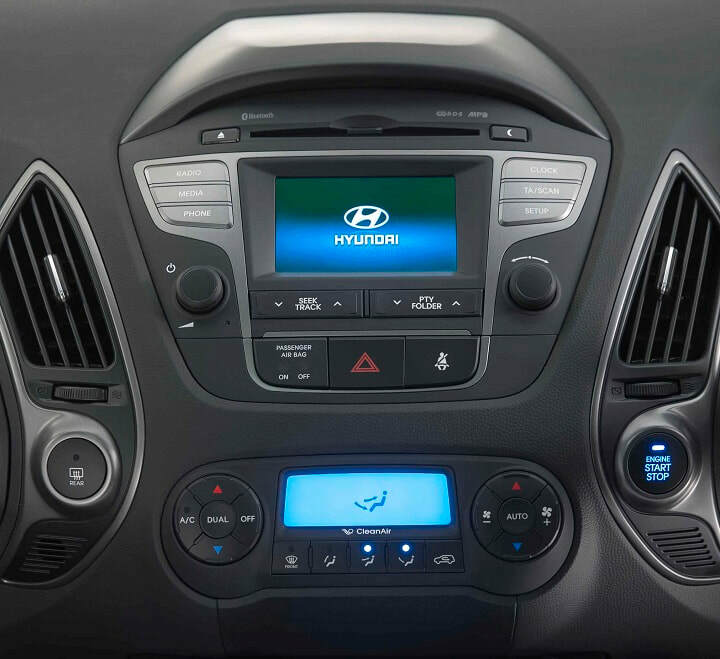 One of the many reasons to find a Hyundai ix for sale is its available 4” LCD touchscreen. The rear view camera which is connected to the touch screen makes parking more convenient and safer in the ix35. With the camera it is easy to see any objects which are hidden behind your vehicle. The Elite model boasts a panoramic sunroof so that you can make the most of South Africa’s beautiful scenery. The expansive glass roof creates a feeling of openness and freedom. With integrated Bluetooth it is easy to stay connected to the world. This feature also contributes to safety as you can make calls without taking your hands off the steering wheel. 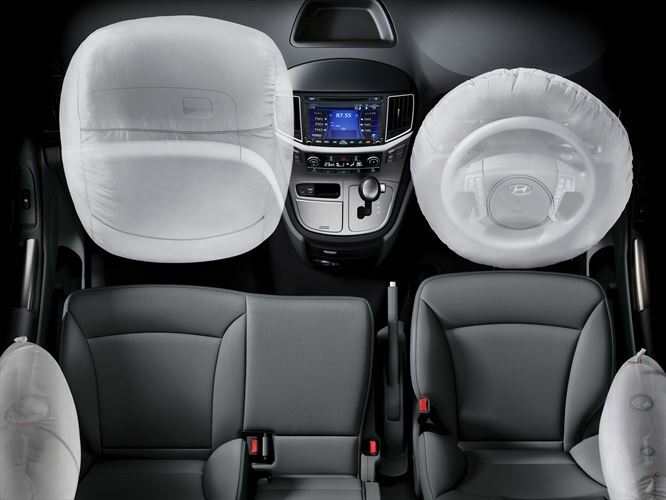 Selected models have six airbags which further contribute to the safety of the Hyundai ix35. The Elite and Executive models feature electric folding mirrors. LED mirror lights further enhance visibility. The ix35’s Powerful PerformanceThe Elite Diesel model features an electric four-wheel drive mechanism. The 4WD ECU responds to challenging conditions by offering the driver accurate handling and increased responsively. The electronic stability control is an active safety feature which supports the driver and helps to keep the vehicle’s occupants safe. 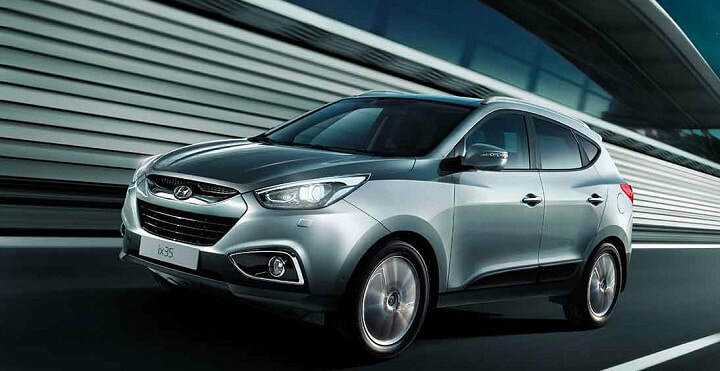 Ready to find your very own Hyundai ix35 - view Group 1 Hyundai’s range of used Hyundai ix35’s available and get a car that is not only great for the family, but in great condition as well. 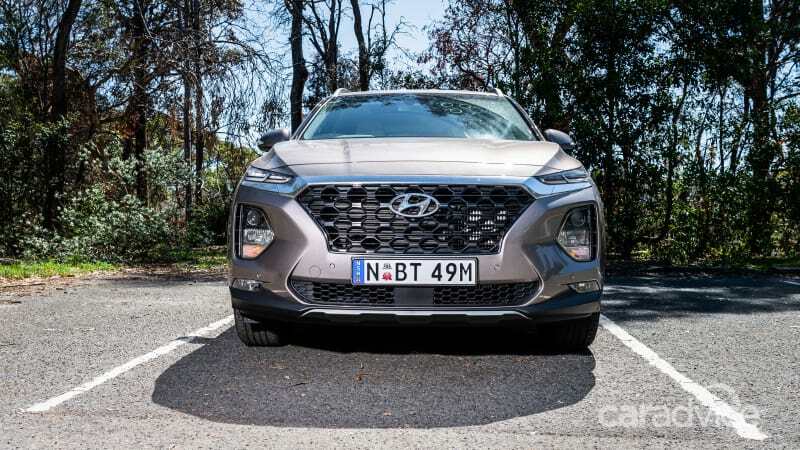 Hyundai Creta in SA: Will the new crossover be a best-seller? Hyundai South Africa is confident that its new Creta crossover will be a hit amongst South Africa's best-sellers. 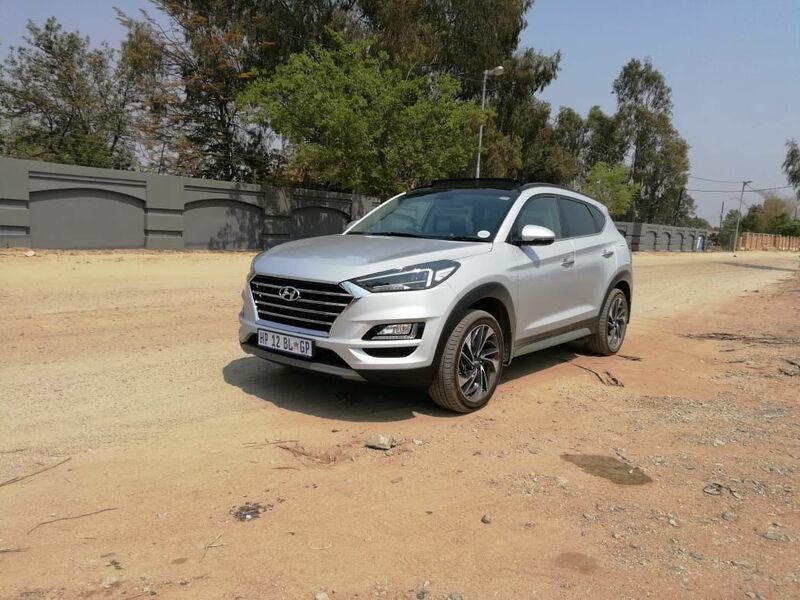 It's not that the Creta is a more affordable - and slightly smaller - than its popular Tucson sibling, but because of the perceivable value for money the new crossover offers. The Creta has already launched in other parts of the world during 2016 and proved to be a success. In India, for example, Hyundai sells 10 000 Creta units per month, while Hyundai SA aims to sell around 400 per month. Game on, as the automaker expands its local line-up. 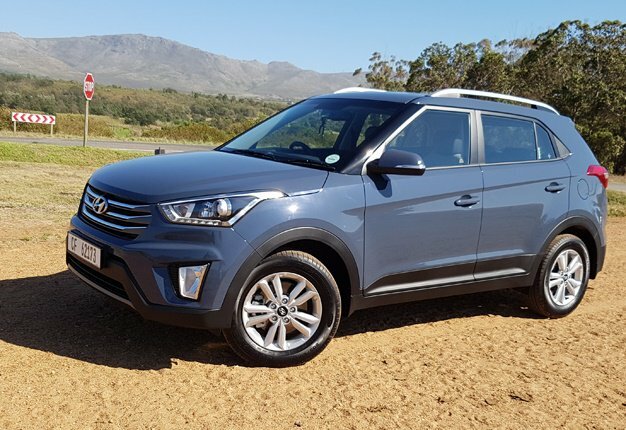 The Creta exudes a sense of maturity, despite being the smallest SUV in the Hyundai range. At the front it has a very upright stance to give it somewhat of a presence on the road. Compared to the Tucson, the Creta's ground clearance is also slightly higher (190mm vs. 172mm), which makes it more at home on gravel. Three derivatives are available, although all available in the same Executive specification. 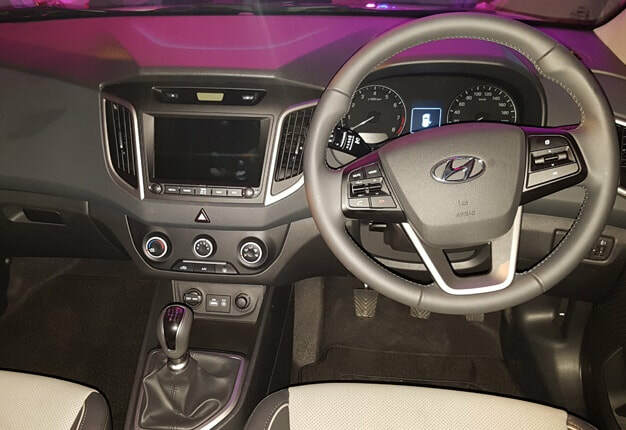 Hyundai has equipped its Creta with cornering headlights, 16” alloy wheels, air vents for rear passengers, rear parking sensors and a reverse camera, and a 20cm infotainment screen with navigation; to mention but a few. Interestingly, the vehicle is not equipped with cruise control, nor does it have traction- or stability control. The interior is predictably laid out and it is not difficult navigating through dials and controls. Leather seats are standard across the range, as are power windows. Only the driver’s window has single-touch operation. Two engine choices options are available - a 1.6-litre petrol and 1.6-litre diesel. The petrol unit is mated to either a six-speed manual or six-speed automatic gearbox. With 90kW/150Nm available from the naturally aspirated (n/a) engine, performance is adequate rather than brisk or lively. It accelerates with the calmness that is associated with n/a engines of this size and gradually builds up speed to 120km/h. At the launch we sampled the manual petrol-powered version. Uphill driving requires a lower gear or two to propel it upwards, but on flat surfaces it trots along at a very leisurely pace. The diesel engine churns out a punchy 94kW/260Nm and is coupled to a six-speed auto ‘box. But despite boasting a healthy torque figure, the full 260Nm is only available at a high 2750rpm. This means that this engine, too, needs to be worked a bit to perform, but it's much smoother and more drivable than its petrol counterpart. The automatic gearbox isn’t the fastest nor the quickest-shifting unit on the market, but it matches the calm demeanour of the diesel-powered Creta. The suspension is one of the Creta’s strongest assets. Over the various surfaces - tar, gravel, back roads - the Creta managed to stand its ground. Hyundai spent quite some time on fine-tuning the suspension. At the front the MacPherson struts adopt an I-shaped front sub-frame, while at the back the shocks are positioned in a more vertical position. This all adds up to bumps being absorbed in exemplary fashion for a vehicle in this segment. Steering is light at lower speeds, but firms up as the vehicle’s speed increase. Driving on the launch route’s gravel sections proved to be little hassle for the Creta (knowing the route did of course help). The crossover went about its business, casually gobbling kilometre after kilometre of dirt road. The Hyundai Creta price, along with its likable specifications and features all make a great package. Test drive a Hyundai Creta at a Group 1 Hyundai dealership and feel for yourself that driving the Creta is where you belong. 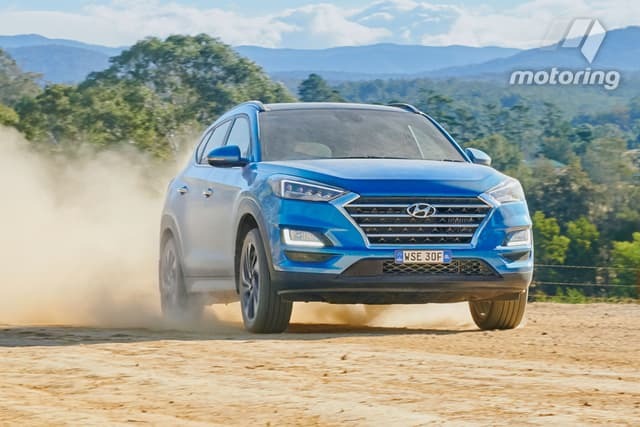 The upgraded 2019 Hyundai Tucson takes over from where Hyundai Australia’s top-selling SUV leaves off. The popular mid-size crossover brings a fresh design inside and out, recalibrated suspension and lots of standard features including LED driving lights, a touch-screen infotainment system with Apple CarPlay and Android Auto, and dusk-sensing headlights. There's plenty of safety tech too. What’s the Tucson like to drive? Do Hyundai SUV owners think of the places their vehicles are named after? There’s Sante Fe in California, Kona in Hawaii and of course Tucson in Arizona. Personally I don’t make the association. 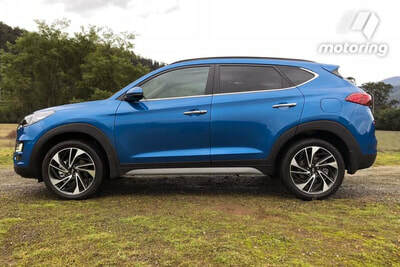 When I hear Tucson I think “easy to drive, well-equipped mid-size SUV with a solid warranty” and that theme continues with the facelifted 2019 Hyundai Tucson. 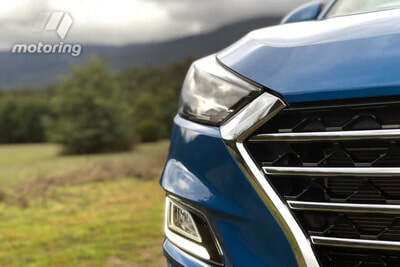 Hyundai’s proclivity for tuning the suspension of its cars in Australia for Australian conditions continues to pay dividends, the 2019 Tucson delivering buttery smooth ride comfort that will allow grandma to snooze but also the sort of athletic ability that would make Chuck Norris raise an eyebrow. The entry-level Go and Active X models cruise serenely on their smaller 17-inch wheels (steel and alloy respectively), the recalibrated suspension soaking up road ructions like a sponge. Speed bumps? You barely feel them; it’s really quite impressive. Mid-level Elite and top-level Highlander model grades ride on bigger alloy wheels (18- and 19-inch respectively) yet are almost as compliant. But it has to be said, all model grades are fun to drive when you turn up the tempo. 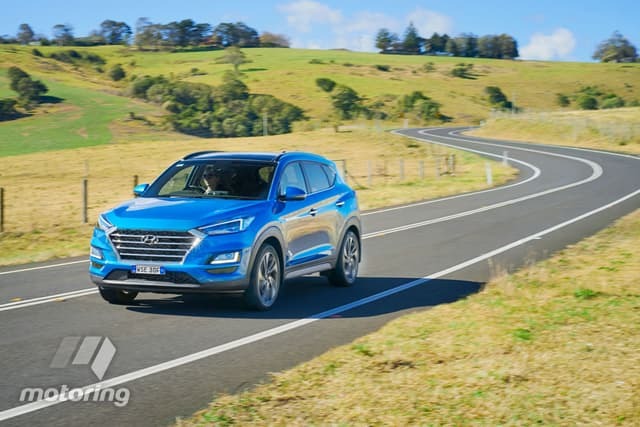 On some twisty hills near the Victoria alpine country the latest Hyundai Tucson proved it can dance like Jason Derulo, generating impressive levels of grip with only mild body roll. The steering isn’t particularly engaging (despite a tweaked ratio: 2.7 to 2.5 turns lock-to-lock) but for a medium-sized SUV the car is a great all-rounder and I reckon it comes close to the top-selling Mazda CX-5 for overall ride and handling prowess. But wait, there’s more! The Hyundai Tucson handled dirt tracks – at regular and warp speeds – with surprising composure. The all-wheel drive models performed better than expected, delivering plenty of feel on loose surfaces and changing direction in a predictable fashion on a short gravel loop. Around town the new Tucson is very effective and although its 172mm ground clearance is not class-leading, the raised view of the road is above average and like all SUVs the raised hip height improves ingress and egress and cargo loading into the boot – no more bending over and all that. There’s no engine idle-stop function to save fuel when stationary but the auto hold electronic park brake is a good feature, automatically engaging the electronic park brake when stopped, such as at the traffic lights. The benefit here is you don’t need to constantly push the brake pedal, reducing wear and tear on the brake lines and pads. But there’s a catch. Only half the range gets this as standard — the Elite and Highlander variants. The base Go and Active X require a SmartSense option pack to get it… more on that issue later. Which is the best Tucson engine? The entry-level 2.0-litre petrol engine (122kW/205Nm) lacks the acceleration of its turbocharged sisters but she’s a willing performer and is the most affordable engine type. 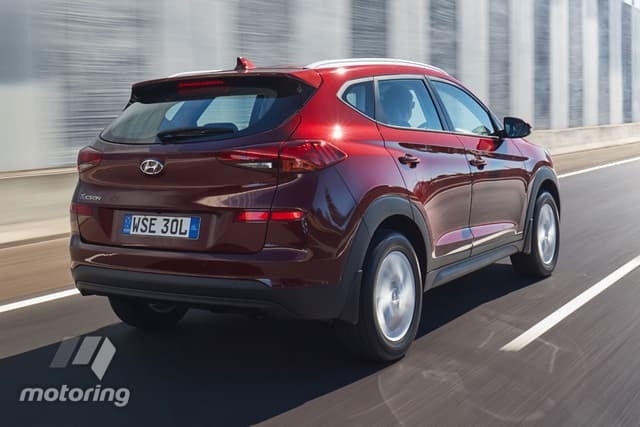 I tested the entry-level Hyundai Tucson Go with this base engine and six-speed auto and the latter is a neat shifter and more involving than the average continuously variably transmission or CVT. One up, the 122kW engine works well but with four or five people and their luggage on board I get the feeling it would struggle up steeper hills without having its neck well and truly wrung. The 1.6-litre turbo-petrol four (130kW/265Nm) is probably the pick of the bunch, but that’s only because the top-shelf 2.0-litre turbo-diesel (136kW/400Nm) costs more. The diesel mill has the most pulling power and can really hustle. It would suit those who plan to tow from time to time, with a 1600kg braked towing capacity. 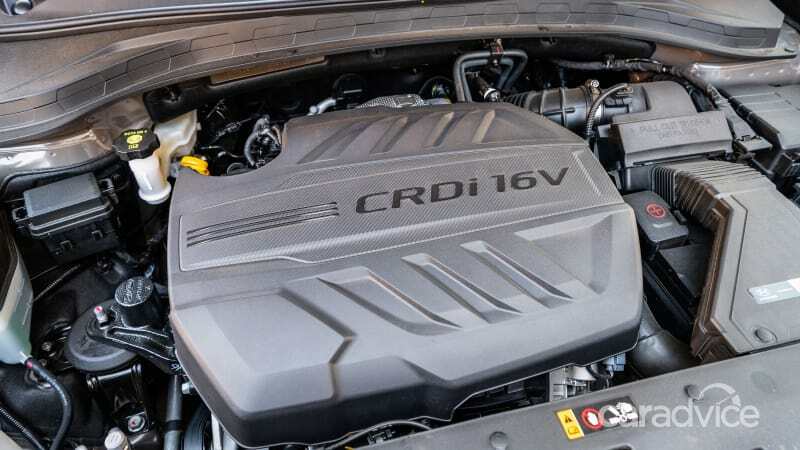 For a diesel it’s a quiet and refined engine and hooked up to a savvy new eight-speed automatic transmission (borrowed from the fancy new Santa Fe) that keeps it in the torque band when you want to go fast, yet slots into higher gears when you want to conserve fuel. The 1.6-litre turbo-petrol is paired with a smooth but responsive seven-speed dual-clutch automatic that carries over from the previous model, but I reckon it’s worth the extra moolah. It’s a great all-round powertrain, the 1.6-litre engine developing lots of mid-range torque that’s great for blatting around in the ‘burbs, plus a tasty top-end that’s welcome while burying the foot during an overtake. One colleague mentioned the seven-speed auto had a slow clutch uptake, allowing it to roll backwards under light throttle openings on an incline — like the older VW dual-clutch (DSG) cars — but during my two-day launch drive the Tucson DCT exhibited no such foibles. What’s the Tucson cabin like? The facelifted 2019 Hyundai Tucson gets new-look front and rear end designs with angular visuals you can ogle in the video, and I reckon all models look good (even the Go model with its steel wheels and hub caps! ), but it’s the interior that makes the strongest impression. 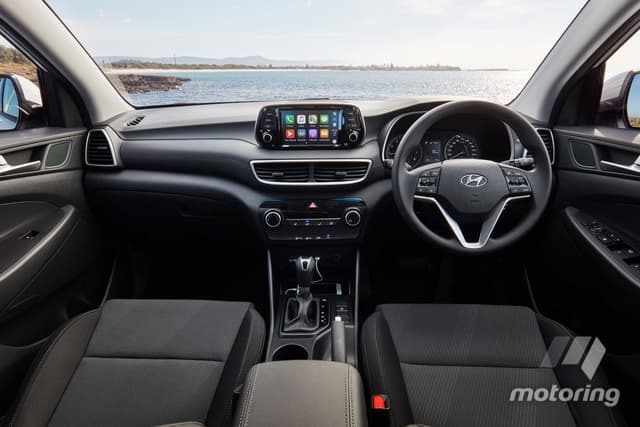 Gone are the older air-vent ‘wings’ that dominated the dashboard and flanked the previous Tucson’s smaller infotainment screen, with bigger 7.0- or 8.0-inch tablet-style infotainment screens perched higher on the dash, making them easier to decipher at a glance. The dashboard design has improved greatly with better horizontal flow (I’ve been hanging out with car designers too much!) and although there’s still some cheap, hard plastics in evidence, soft surfaces cover all the major touch points. 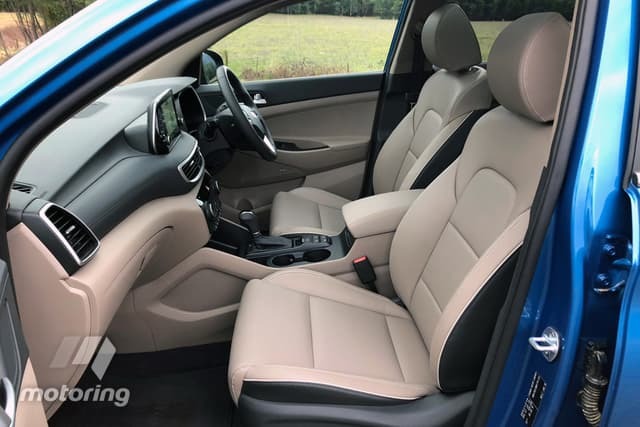 All model grades except the Tucson Go come with leather upholstery and it looks and feels pretty schmick, especially with the two-tone beige finish. There’s a clean and fresh look to almost everything inside the new 2019 Hyundai Tucson… except for the instrument cluster. It looks dull — even in on top-spec models. Is Hyundai aping Toyota in this respect? A splash of colour or a different font would be nice, especially for something you look at all day. There’s only one USB port up front and one for the back seat – except Go models miss out on the back-seat USB port. Go and Active X also miss out on rear-seat air-vents, which is a bit penny-pinching. Some of the ‘wow-factor’ features on the range-topping Tucson Highlander include heated, cooled and power-adjustable front seats, a wireless phone charger, a massive panoramic glass roof and even a heated steering wheel. 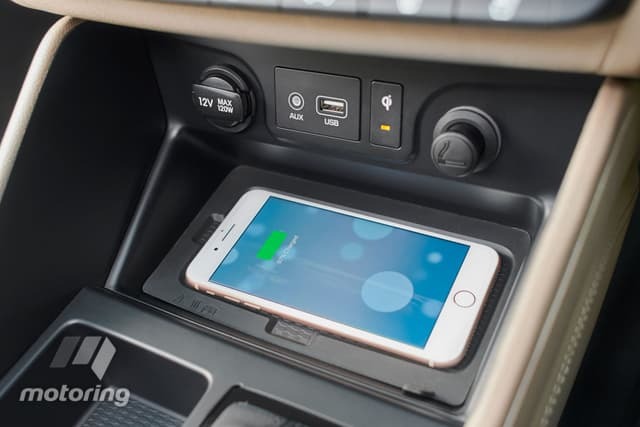 But every 2019 Hyundai Tucson comes with Bluetooth audio and phone streaming plus Android Auto and Apple CarPlay to streamline functions, all of which work as intended. All models also get steering wheel audio, phone and cruise controls, reversing camera, six airbags, LED daytime running lights and automatic headlights. All models also get downhill brake control, hill-start assist and Hyundai Auto Link connectivity — a smartphone app that connects via Bluetooth and provides tyre pressure monitoring, driving history, speed statistics, vehicle health checks and more. It’s pretty handy, and there’s a premium version that involves an in-car SIM card, the subscription for which is free if you service your car at a Hyundai dealer. Given all the telecom systems, you’ll rarely feel like a bandicoot on a burnt ridge (read: lonely). Height-adjustable front seat support is good and there’s ample room for two big blokes but the back seat isn’t quite as roomy as some of its larger rivals, such as the Nissan X-TRAIL and Mazda CX-5. 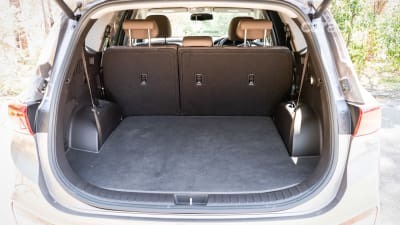 The Tucson (4480mm) is shorter than the Mazda CX-5 (4550mm) and Nissan X-TRAIL(4690mm), but boot space isn’t too bad at 488 litres (expanding to 1478 litres), which compares favourably with the CX-5 (442L/1342L) but not so much the X-TRAIL (565L/945L). All models have roof racks as standard, with a 100kg load limit, and they can easily tow a jet ski with 750kg of unbraked trailer capacity (1500kg braked for petrol models). All models come with a full-size spare wheel, double-extending front sun visors and acoustically laminated windscreens, the latter helping keep the cabin fairly well isolated from outside noises. The new 2019 Hyundai Tucson is a well sorted machine. It has a solid five-year, unlimited-kilometre warranty – although the company is considering seven years – and service intervals of 12 months or 15,000km (12,000km for the 1.6 turbo-petrol) are generous. 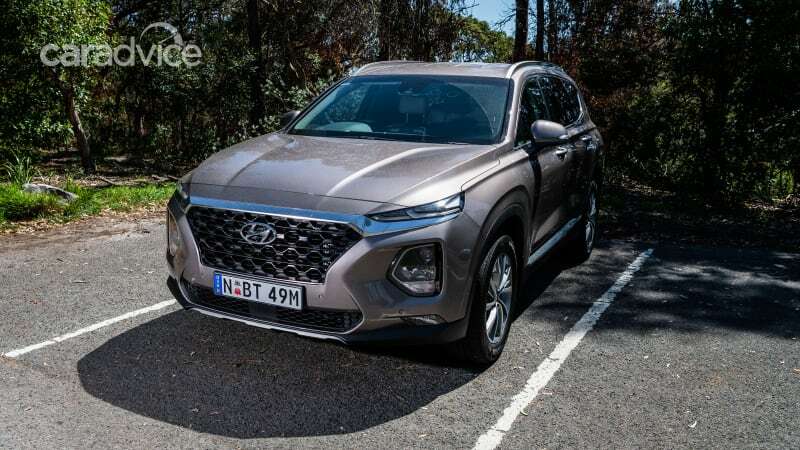 It’s unlikely we’ll see the next SUV from the South Korean automotive giant named the Hyundai Sydney – it’s a place in Florida! – but the Tucson name is starting to resonate with virtues such as quality and value for money, without cutting corners. The Hyundai Tucson is arguably one of the best vehicles in its class and its new local chassis tune is excellent. Given the size and competitiveness of the medium SUV market, and the fact it’s about to face more tough competition from all-new Toyota RAV4 hybrid and Subaru Forester models due soon, this upgrade is well timed. Now, where did that fire-breathing, muscle-flexing Hyundai Tucson N hero model get to? Find our more about the Hyundai Tucson’s specs and available Hyundai Tucson offers at Group 1 Hyundai.